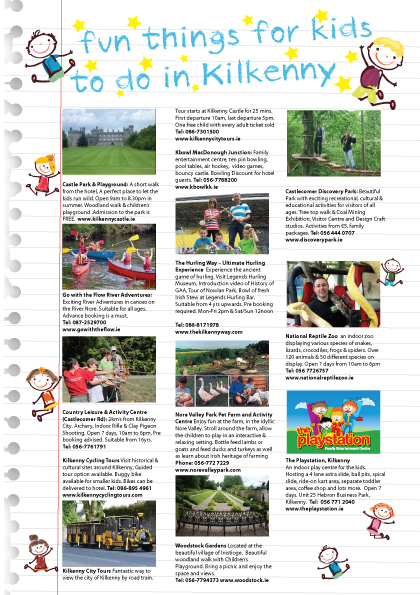 If you are looking at ways to entertain your children and make holiday memories that last forever - we have compiled a comprehensive guide of things to do with children in Kilkenny. There is a fantastic array of activities to keep everybody in the family entertained all close by or within a short drive of the hotel. Please download our Things to do with Children here. This summer why not make the most of the hotel’s great location and take a Family Picnic to the Castle Park. 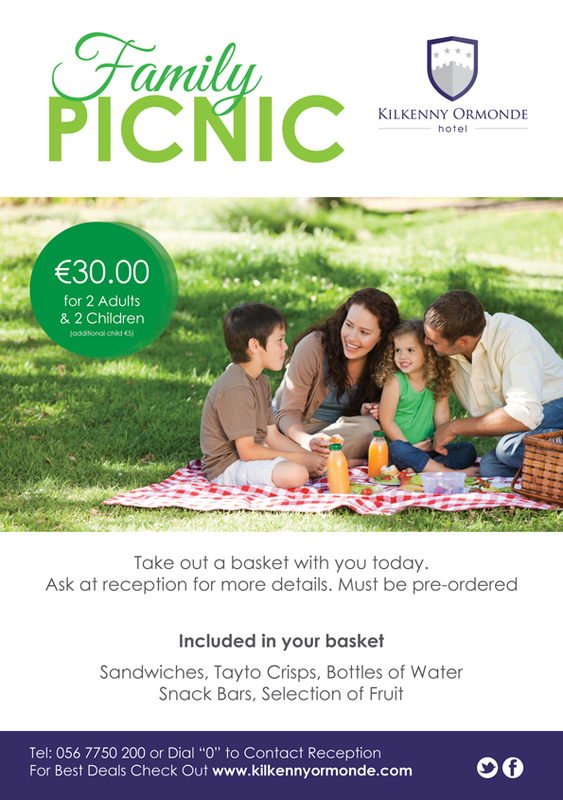 Picnic cost €30 for 2 Adults and 2 Children Available July and August. Please enquire at Reception. Ever wondered what a snake feels like? Or how much alligators eat? National Reptile Zoo is an indoor facility 20 minutes drive away. Ireland's only reptile zoo, open 7 days a week from 10am till 6pm. Just a three minute walk from Kilkenny Ormonde Hotel. Enjoy an easy paced 2 hours, visiting historical & cultural sites around Kilkenny. Bikes for all ages, pre-booking advised but not essential. Great outdoor adventures, walking trails, boating lake, tree top walk, zip line and much more. Experience firsthand the ancient Celtic game of Hurling. Visit Legends Hurling Museum. Introduction Video of the History of GAA, Tour of Nowlan Park. Bowl of fresh Irish Lamb Stew at Legends Hurling. Stroll around the farm, bottle feed lambs or goats and feed ducks and turkeys. Allow the children experience an Irish farm. Approximately 20 minutes by car. Open Monday to Saturday. Located a 2 minute drive from Kilkenny city centre. Open 7 days a week 10 am till 6pm, Sundays 12pm till 6pm. Under 2's free with paying child (€7). Adults are free.